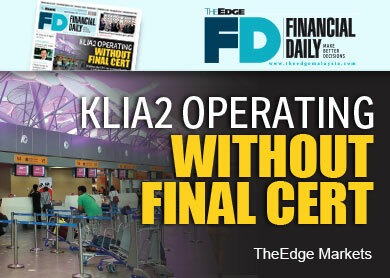 KUALA LUMPUR: Six months after the opening of klia2 in Sepang on May 2, Malaysia Airports Holdings Bhd (MAHB) has yet to issue a Certificate of Practical Completion (CPC) for the main terminal building of the RM4 billion low-cost carrier terminal, sources familiar with the matter told The Edge Financial Daily. A CPC is a documented verification in which all works and tasks included in a contract have been satisfactorily completed. Without the CPC, the terminal building is still under the responsibility of the main contractor — the UEM Construction Sdn Bhd (UEMC) and Bina Puri Sdn Bhd joint venture (UEMC-Bina Puri JV) — and not MAHB, said one source. It is unusual that an airport is operating without a CPC for such a long period of time, according to industry sources. scenario may be that UEMC-Bina Puri JV has not completed certain works. UEMC is a wholly-owned unit of UEM Builders Bhd. “There may even be minor details, such as putting up the right light bulbs,” said an industry source. When contacted, Bina Puri group executive director Matthew Tee confirmed that the CPC has yet to be issued for klia2. But he did not reveal the cause of it. However, MAHB has yet to respond to The Edge Financial Daily’s queries on the matter as at press time. MAHB said in March the terminal building must obtain the Certificate of Completion and Compliance (CCC) based on the relevant authorities’ requirements, and all works must be completed according to MAHB’s operational requirements as stated in the contract in order to obtain the CPC and for the full handover to take place. The CCC was handed to MAHB on April 17, 2014, three months after the original due date of Jan 31. The issuance of the CCC not only certifies the safety of the project, but also gives approval to all relevant parties to occupy the terminal building, including airlines that can start operating from the new hybrid terminal. Another source pointed out that if the CCC has been given to klia2, UEMC-Bina Puri JV should have by now obtained at least partial completion of the CPC. All said, the International Civil Aviation Organization (ICAO) has verified that klia2 is structurally in compliance with its requirements and safety standards. The verification, according to then Acting Transport Minister Datuk Seri Hishammuddin Hussein meant that klia2 is safe. The ICAO arrived on April 14 at the invitation of the government to evaluate if there were structural issues at the airport following AirAsia Bhd’s dissatisfaction with the matter, particularly depressions on the apron and runway. To recap, the opening of klia2 had been delayed several times. The project was tendered out in 2009 with the expected completion date in September 2011. The delays had resulted in MAHB, AirAsia and UEMC-Bina Puri JV finger-pointing at each other. MAHB last year sought compensation by imposing liquidated ascertained damages on the contractors for the delay in the opening of the new terminal.